Use this double window envelope for convenience when mailing checks. It measures 3 7/8" x 8 7/8." Order a sample or call to confirm compatibility with your check software. 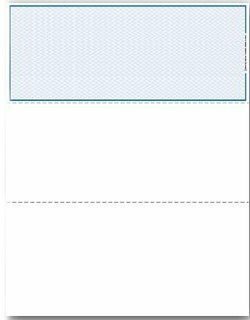 Use this high quality blank check stock with your accounting software, laser printer and MICR toner to produce complete checks. Each 8 1/2" x 11" sheet contains 1 top check and 2 stubs, and is constructed of 24# paper. Measuring From the top down, the check portion is 3.5", the 1st stub begins at 3.5" and is 3.5" high, the 2nd stub begins at 7" and measures 4" in height. (This is the check/stub spacing used by Quickbooks.) These laser checks DO NOT include a signature line. Indicate the check color when ordering.